2003-06-11 Assigned to SHIRE LABORATORIES, INC reassignment SHIRE LABORATORIES, INC ASSIGNMENT OF ASSIGNORS INTEREST (SEE DOCUMENT FOR DETAILS). Assignors: CHANG, RICHARD, BURNSIDE, BETH, COUCH, RICHARD A. 2005-10-19 First worldwide family litigation filed litigation Critical https://patents.darts-ip.com/?family=31996998&utm_source=google_patent&utm_medium=platform_link&utm_campaign=public_patent_search&patent=US20040059002(A1) "Global patent litigation dataset” by Darts-ip is licensed under a Creative Commons Attribution 4.0 International License. 2006-12-19 Assigned to SHIRE LLC reassignment SHIRE LLC MERGER (SEE DOCUMENT FOR DETAILS). 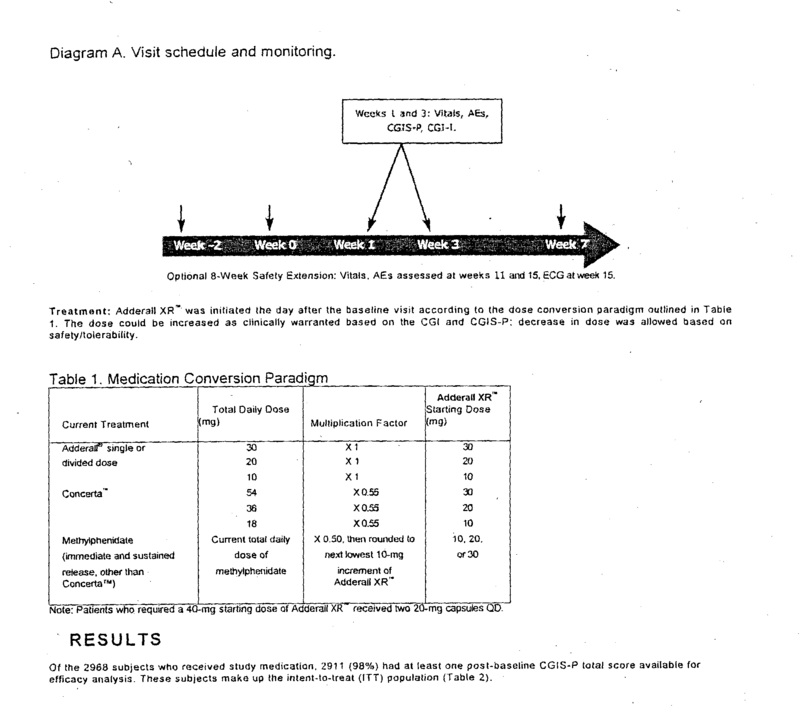 Assignors: SHIRE LABORATORIES, INC.
A pharmaceutical composition comprises a once-a-day sustained release formulation of at least one amphetamine salt which provides mean plasma concentration profile aspects in human ADHD patients which are substantially the same as that provided by ADDERALL XR® type pulsatile formulations. By substantially the same “profile” herein is meant that two curves have substantially the same AUC (area under the curve) and C max, e.g., these parameters for each curve are ±20% of each other, or even closer, eg ±10%, ±5%, ±2%, etc., which parameters are entirely conventionally defined and determined. See, e.g., Fundamentals of Clinical Pharmacokinetics. J. G. Wagner, Drug Intelligence Publications, Inc., Hamilton, Ill., 1975; Guidance for Industry, Bioavailability and Bioequivalence Studies for Orally Administered Drug Products-General Considerations, FDA, CDER. October 2000. For FIG. 1, AUC (time zero to infinity) is 556.6 ng hr/mL and Cmax is 28.0 ng/mL for d-amphetamine and 205.1 ng hr/mL and 8.7 ng/mL, respectively, for 1-amphetamine. Of course, plasma curves achieved by this invention can follow even more closely the course of a target curve such as that shown in FIG. 1, e.g., substantially (e.g, ±20%) matching initial rising slope, post-peak curve shapes, Tmax values, (7.1 hr for d-amphetamine and 7.4 hr for 1-amphetamine for FIG. 1), etc. Whereas FIG. 1 shows data for 20 mg tablets (i.e., two 10 mg pulsatile doses), the plasma curves (and e.g., AUC and Cmax) corresponding to other daily doses such as 10, 30, 40, 50, 60, 70, 80, 90 mg will be essentially linearly proportional to those shown in FIG. 1, corresponding to the involved dosage. Principles of sustained release formulation technology applicable to this invention, including the exemplary modes mentioned herein, are disclosed, e.g., in R. K. Chang and J. R. Robinson, chapter 4: “Sustained Drug Release from Tablets and Particles Through Coating,” in  Pharmaceutical Dosage Forms: Tablets, volume 3, edited by H. A. Lieberman, L. Lachman, and J. B. Schwartz, Marcel Dekker, Inc., 1991; R. J. Campbell and G. L. Sackett, chapter 3: “Film coating,” in Pharmaceutical Unit Operations: Coating, edited by K. E. Avis, A. J. Shukla, and R. K. Chang, Interpharm Press, Inc., 1999, whose disclosures are entirely incorporated by reference herein. The entire disclosures of all applications, patents and publication, cited above, and below, are hereby incorporated by reference. Ethyl cellulose (15.46 gram) was dissolved in 515 gram of ethyl acetate. Into a Wurster column was charged 500 grams of MASL beads which were then coated with the coating mixture under conditions of 40° C., spray pressure  1 bar, and spray rate of 10 grams/min. The line was rinsed with ethyl acetate and the pellets were dried for approximately twenty minutes and recovered to give a product of 97% by weight NTASL beads and 3% by weight ethyl cellulose coating. Inclusion Criteria: Good physical health with normal blood pressure, pulse, and electrocardiogram (ECG); Conners Global Index Scale-Parent (CGIS-P) rating score of < —12 for boys and <—10 for girls; known responder to psychostimulant medication. Exclusion Criteria: Uncontrolled; symptomatic comorbid psychiatric disorder; IQ<80; history of seizure disorder or Tourette's; concomitant medications, such as clonidine, guanfacine, anticonvulsants, or any medications that affect blood pressure or the heart. Individual patients were treated with ADDERALL XR®, 20 mg. Subjects received either one single dose administered with food or one single dose administered following a 10-hour overnight fast through continued fast 3.5 hours post dosing. A sampling of individuals' curves is given in FIGS. 7-12. The mean plasma concentration profile of FIG. 1 was obtained from averaging such individuals' curves. 1. A pharmaceutical composition comprising a once-a-day sustained release formulation of at least one amphetamine salt which provides a mean plasma concentration profile in human ADHD patients which is substantially the same as that provided by a formulation thereof comprising an immediate release dose and a dose delayed therefrom by about 2 to about 6 hours. 2. A pharmaceutical composition of claim 1 wherein the immediate and delayed release doses are the same. 3. The pharmaceutical composition of claim 2, wherein the at least one amphetamine or amphetamine salt is a mixture of two or more amphetamine salts. 4. The pharmaceutical composition of claim 2, wherein at least one amphetamine or amphetamine salt is a mixture of dextroamphetamine sulfate, dextroamphetamine saccharate, amphetamine aspartate monohydrate and amphetamine sulfate. 5. A pharmaceutical composition of claim 4, wherein said profile is substantially the same as that of FIG. 1. 6. A pharmaceutical composition comprising a once-a-day sustained release formulation of at least one amphetamine salt which provides a mean plasma concentration profile in human ADHD patients which is substantially the same as that of FIG. 1. 7. The composition of claim 6, wherein at least one amphetamine or amphetamine salt is a mixture of dextroamphetamine sulfate, dextroamphetamine saccharate, amphetamine aspartate monohydrate and amphetamine sulfate. 8. The pharmaceutical composition of claim 7, wherein the dextroamphetamine sulfate, dextroamphetamine saccharate, amphetamine aspartate monohydrate and amphetamine sulfate salts are administered in equal amounts by weight. 9. The pharmaceutical composition of claim 6, wherein the at least one amphetamine or amphetamine salt is provided in a core which is coated with a coating comprising a pharmaceutically acceptable water-insoluble film former or other polymer providing sustained release. 10. The pharmaceutical composition of claim 9, wherein the coating further comprises a dissolution regulating agent. 11. A pharmaceutical composition of claim 1 comprising a sustained-release formulation of said salt(s) and a dosage form for immediate release of at least one amphetamine salt. 12. The pharmaceutical composition of claim 6, wherein the at least one amphetamine or amphetamine salt is provided in a sustained release matrix. 13. A method for treating attention deficit hyperactivity disorder which comprises administering to a human patient in need thereof a pharmaceutical composition of claim 1. 14. A method for treating attention deficit hyperactivity disorder which comprises administering to a human patient in need thereof a pharmaceutical composition of claim 5. 15. A method for treating attention deficit hyperactivity disorder which comprises administering to a human patient in need thereof a pharmaceutical composition of claim 6. 16. A pharmaceutical composition comprising a once-a-day sustained release formulation of at least one amphetamine salt which provides a mean plasma concentration profile in human ADHD patients which has substantially the same initial slope as that of FIG. 1. 17. A pharmaceutical composition comprising a once-a-day sustained release formulation of amphetamine salts which provides a mean plasma concentration profile in human ADHD patients which has an initial slope of about 3.7 to about 11.4 ng/(mL hr) for dextroamphetamines and about 1.4 to about 3 ng/(mL hr) for levoamphetamines, all at a total amphetamine dose of 20 mg or an initial slope directly proportional thereto for a total dose other than 20 mg.
18. A pharmaceutical composition comprising a once-a-day sustained release formulation of at least one amphetamine salt which provides a mean plasma concentration profile in human ADHD patients which has an initial slope of about 4 to about 8 ng/(mL hr) for dextroamphetamines and about 1.5 to about 2.2 ng/(mL hr) for levoamphetamines. 19. A method for treating attention deficit hyperactivity disorder which comprises administering to a human patient in need thereof a pharmaceutical composition of claim 16. 20. A method for treating attention deficit hyperactivity disorder which comprises administering to a human patient in need thereof a pharmaceutical composition of claim 17. 21. A pharmaceutical composition comprising a once-a-day sustained release formulation of at least one amphetamine salt which provides a mean plasma concentration profile in human ADHD patients which has an AUC of 556.6 mg hr/mL±20% and a Cmax of 28.0 ng/mL±20% for d-amphetamine and an AUC of 205.1 ng hr/mL±20% and a Cmax of 8.7 ng/mL±20% for 1-amphetamine. 22. A method for treating attention deficit hyperactivity disorder which comprises administering to a human patient in need thereof a once-a-day sustained release formulation which provides a mean plasma concentration profile in human ADHD patients which has an AUC of 556.6 mg hr/mL±20% and a Cmax of 28.0 ng/mL±20% for d-amphetamine and an AUC of 205.1 ng hr/mL±20% and a Cmax of 8.7 ng/mL±20% for 1-amphetamine. MXPA05003129A MXPA05003129A (en) 2002-09-24 2003-09-24 Sustained released delivery of amphetamine salts. OA1200500086A OA13075A (en) 2002-09-24 2003-09-24 Sustained released delivery of amphetamine salts. ZA200502406A ZA200502406B (en) 2002-09-24 2003-09-24 Sustained released delivery of amphetamine salts. ES03754811T ES2360046T3 (en) 2002-09-24 2003-09-24 Administration of amphetamine salts controlled release. MA28168A MA27469A1 (en) 2002-09-24 2005-03-21 Administration of prolonged release amphetamine salts.